Well finally! I went to a grownup movie and it was great! "Ricki and the Flash" was so very very good. I really have no negatives about it. The casting and acting were superb. Meryl Streep and Mamie Gummer are real life mother and daughter and play that in the movie. Kevin Kline is the ex-husband/father. The story is after having three children Mom decides to move alone from Indianapolis to California to pursue her dream of becoming a rock star. She comes back after twenty years of sporadic contact to help her daughter deal with a devastating divorce. The chemistry between her and her family is amazing. Her ex-husband's wife has difficulty dealing with her presence, and rightly so. She is played by Audra McDonald, a Tony award winning actress. 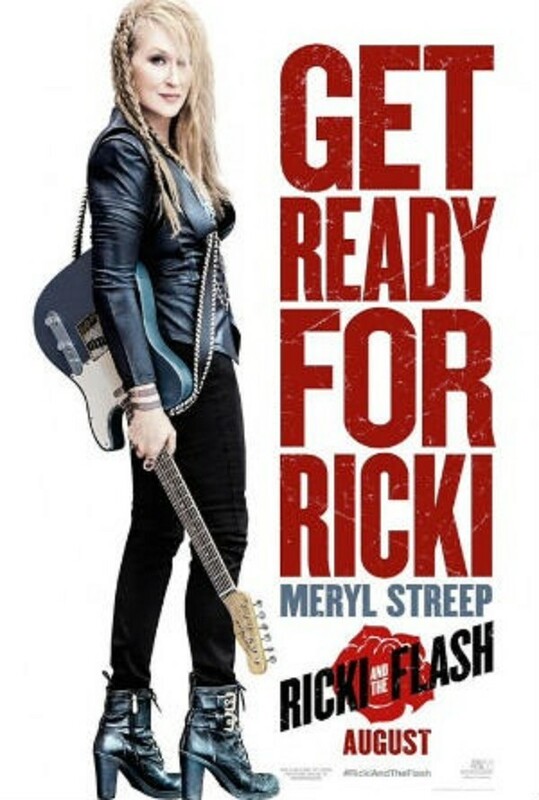 Ricki's love interest a guitar player in her band The Flash, is played by Rick Springfield. It's nice to see and hear him again. Speaking of hearing, the music is great. I definitely would like to purchase the sound track. If you do enjoy the music stay through the final credits to hear more of this great sound. All-in-all it's a fun, sweet, entertaining movie. So definitely go. Have fun. Eat popcorn.